The goal of database performance tuning is to minimize the response time of your queries. It is also to optimize your server's resources by minimizing network traffic, disk I/O, and CPU time. 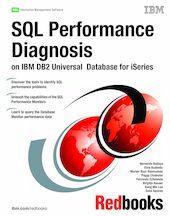 This IBM Redbooks publication helps you to understand the basics of identifying and tuning the performance of Structured Query Language (SQL) statements using IBM DB2 Universal Database for iSeries. DB2 Universal Database for iSeries provides a comprehensive set of tools that help technical analysts tune SQL queries. The SQL Performance Monitors are part of the set of tools that IBM i5/OS provides for assisting in SQL performance analysis since Version 3 Release 6. These monitors help to analyze database performance problems after SQL requests are run. This book also presents tips and techniques based on the SQL Performance Monitors and other tools, such as Visual Explain. You'll find this guidance helpful in gaining the most out of both DB2 Universal Database for iSeries and query optimizer when using SQL.